The Humanities Institute at UC Santa Cruz will present Data and Democracy—the fifth installment of its signature Questions That Matter series—on Tuesday, January 29, at Kuumbwa Jazz Center in downtown Santa Cruz. The evening will feature a conversation with associate professor of linguistics Pranav Anand and professor of computer science and engineering Lise Getoor, moderated by history professor and Humanities Institute director Nathaniel Deutsch. The Questions That Matter series is designed to bring together UC Santa Cruz faculty with community residents and students to explore the big questions that matter to everyone. It is part of a strategic initiative of The Humanities Institute to champion the role and value of the humanities in contemporary life. “We’re going to look at what are some of the core elements of modern democracy, the way that data has changed and who has access to it, and how this has the potential to transform our democracy,” said Deutsch. Deutsch noted that the role of humanities is to be present at all stages of technological development as a collaborator—questioning for example how algorithms are written and composed, how they’re implemented, and how they’re regulated. 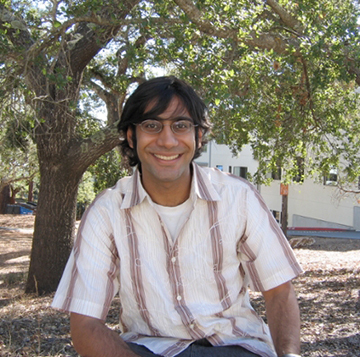 Associate professor of linguistics Pranav Anand is an expert in semantics, pragmatics, syntax, and computational linguistics. His research focuses largely on two matters: how context intrudes into or guides the interpretive process, and how perspective is represented across the world's languages. 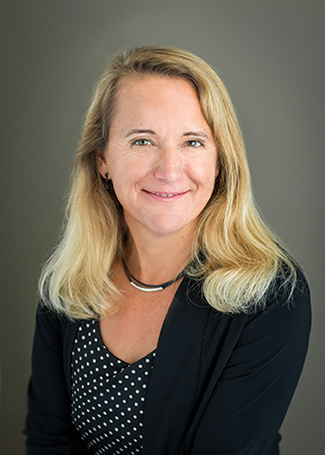 Lise Getoor is a professor in the Computer Science and Engineering Department at UC Santa Cruz and the director of the UC Santa Cruz D3 Data Science Center. Her research areas include machine learning and reasoning under uncertainty, data management, visual analytics, and social network analysis. Getoor is interested in the development of the foundations for responsible data science—exploring such questions as how to understand the ethical and justice issues involved in data-driven decision-making, and how to integrate algorithmic and statistical principles, social science theories, and basic humanist concepts so that we can think critically and constructively about the socio-technical systems we are building. 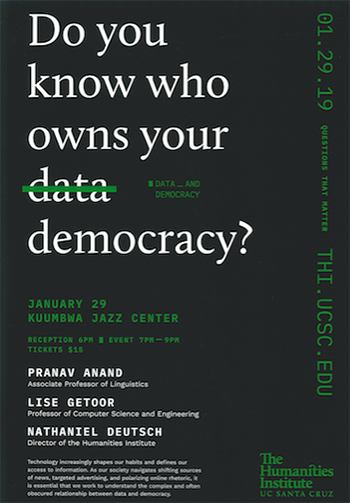 Questions That Matter: “Data and Democracy” takes place on Tuesday, January 29, at Kuumbwa Jazz Center in Santa Cruz. Doors open at 6 p.m. The program begins at 7 p.m. Tickets are $15, including light refreshments. For more information, call (831) 459-5655 or email thi@ucsc.edu. This event is presented by The Humanities Institute at UC Santa Cruz.